Sometimes, I miss the old girl. 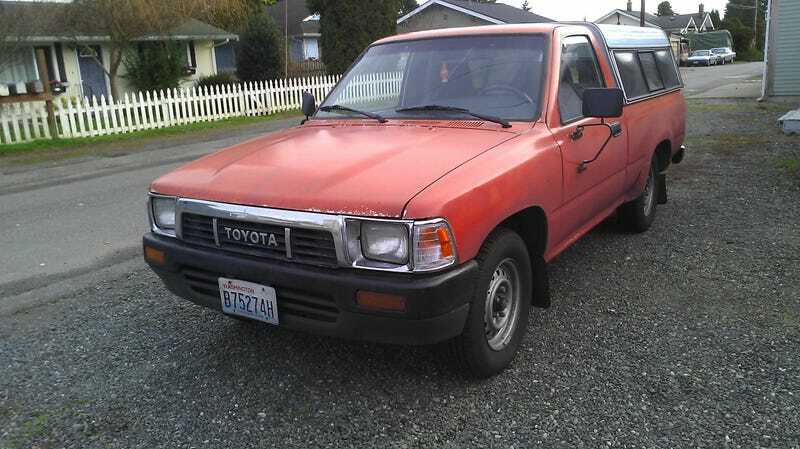 1989 Toyota pickup, 5-speed. First vehicle I ever bought. I was effectively unemployed at the time, spent almost every last cent on it, and served me well for four years. It was hideous, slow, carbureted, interior was gutted, and had over 300,000 miles. But it could drive to the four corners of the Earth, no problem. Some things I really don’t miss about it are the sluggishness (engine was really tired, but it wouldn’t die), the short bed, and trashed interior. Consequently, those were all the things that gave it such an appeal to me as well. I could have kept this pickup all these years and saved myself a small fortune not buying my next four cars. But unlike the rest of my family, it seems obvious I’m not a one-car kind of man.